Beekeeping is an intuitive and exciting task. These magnificent creatures help the human population in many ways. Along with other insects, bees help in pollinating 35% of the world’s crops. If you are in beekeeping business or if you are willing to start it, the first thing in your checklist is the beekeeping suit. There are so many best beekeeping suits available out there which provide a plethora of options. These suits protect against bee stings and probable triggering of allergic reactions. You must wear these suits at any cost if you are allergic to bee pollen. Nonetheless, these bee protection suits are excellent motivators as well; makes you love apiculture. Why Do You need a Bee suit? You might have seen a few advanced users handle their bees without any protection or suits. Well, as it is said, they are professional beekeepers. Over the period, the bees learn that their keepers are no longer a threat to them and hence they don’t sting. If you are a beginner or if you have specific allergies, you must wear these protective suits. The bees raised in apiaries or back yards are usually docile and will not sting. But it is not always true. These bees may directly or indirectly harm you. They can sting you if they feel they are threatened. To prevent the possible injury (bee sting), they are rendered inactive by smoking the colony. Even after smoking them out, there are some potential threats. They may crawl under your clothing or can enter sensitive parts such as nostrils and ears. Beekeeping suits are a must to eliminate all the possible contingencies. Even some advanced users wear these protective suits to prevent potential threats. Now that you know why beekeeping suits are necessary let us look in to some of the best suits that are available out there in the market. This comprehensive guide will help you in selecting the beehive suit that meets your demands. The first product on our list comes from most reputable brands in the beekeeping business. It is known to manufacture quality beekeeping supplies which garnered a big fan base. The Vivo professional beekeeping suit is made of fabric which is light in weight and offers outstanding protection against the bee stings. With a sleeve length of 11.5 inches, it will protect your hands up to the wrists. People with larger hands will get protection up to forearms. These sleeves are elastic and can be stretched according to your comfort. Vivo has provided its beekeeping suit in three different sizes; large, extra large, and kid-sized suits. You can select according to your need. You must consider buying new gloves to get complete security for the hands against bees. There is a hood attached to the suit which will give protection for your head preventing potential injuries to sensitive parts from the bees. For carrying any additional tools, there is a 7-inches large pocket. The Vivo professional beekeeping suit is not only the best in class but also one of the affordable gears on our list. It is easy to maintain but note that you must not use a washing machine for cleaning it. The removable hood and the suit must be washed with hands only. When it comes to protection from painful bee stings, we cannot compromise on the quality. Humble bee is dedicated to manufacturing quality products that meet all the safety standards. This bee suit is made by a combination of 50% cotton and 50% synthetic fibers respectively. The combination makes you feel comfortable in all weather conditions. The Humble bee polycotton beekeeping suit protects your entire body stretching to the extremities of your limbs. You will get protection up to your wrists and ankles. The removable hood is self-supporting and has 360° mesh for an unobstructed view. There are heavy duty brass zippers with which you can zip up the suit comfortably. The six double stitched pockets add extra durability to the suit and also helps you in carrying various tools required for beekeeping. Additional to these dual stitched pockets there are four ballistic pockets made of nylon. It is slightly heavier measuring around 280 grams per square meter (GSM). This bee suit is professionally tailored and come in six different sizes. A carrying case is provided by Humble bee to store or carry the suit according to your convenience. With every purchase, Humble bee donates 10% of the amount to local apiaries to support the bee farming. To enjoy beekeeping by wearing a suit, it must provide complete protection. This property will eliminate the fear of getting stung by the bees. Natural Apiary aims at providing the best protection from the bees. 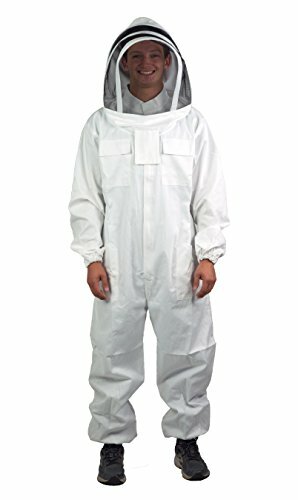 With a unique blend of cotton (65%) and polyester (35%), it is one of the best bee suits available out there in the market. With robust YKK zippers, you can zip the suit along with the veil. The veil is designed in a fencing style which is self-supporting and detachable. The suit is elasticized at wrists and ankles to provide a firm grip so that the bees cannot crawl inside the suite. This suit has extra strength reinforced collar to give the best security against the bees. Even the waist is elasticized for a comfortable fit. The suit is available in eight different sizes, and you can buy according to your requirement. There are four double stitched pockets for carrying tools. Since this suit has all the protection standards, it is ideal for both beginners and professionals. Another perk is that it is machine washable. If you want additional protection for your palms and feet, consider buying gloves and shoes. The bee suits are quite popular in getting dirty. Especially when you are in the process of honey extraction. If your bee protective clothing allows you to clean in versatile conditions, it is an ideal buying factor. The Ultra Breeze beekeeping suits deliver versatile suits. Not only in terms of maintenance, but it also offers excellent protection and outstanding comfort. The suit is made of complete polyester or with a combination of polyester and polyvinyl. It is made in the form of fine mesh so that it provides excellent ventilation and comfort. 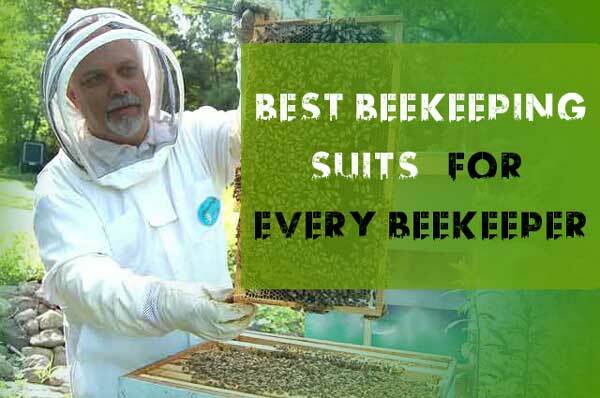 This suit is ideal for those who work with bees in arid climatic conditions. Even though it has a mesh type design; it offers excellent protection against bee stings. The brass zippers hold the suit comfortably and give room for your body for comfortable movement. Although it is a bit expensive than other costumes, it is worth every penny. It is machine washable, and you must use cold water only. The hood is not machine washable, and you must do it with your hands. Do not squeeze it or else you will damage the suit and the veil. 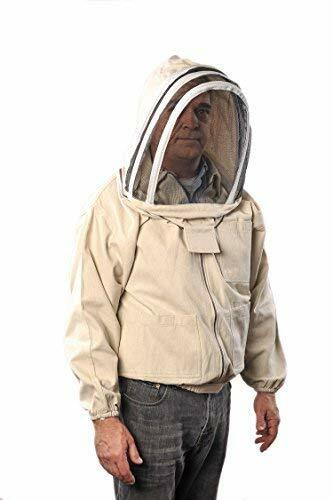 The Ultra Breeze beekeeping suit is available in six different sizes, and you can buy them according to the fit. 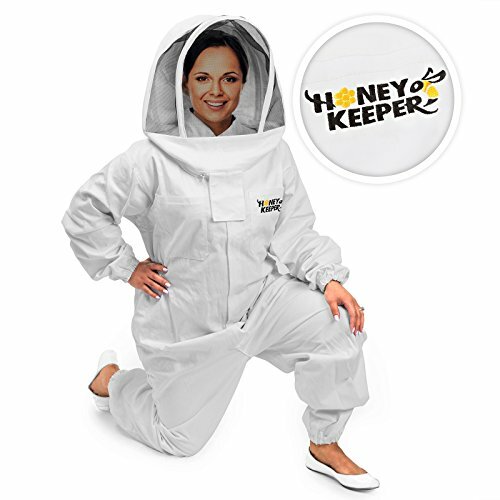 A bee proof suit designed exclusively for adults is the Honey Keeper professional beekeeping suit. It is available in three sizes; large, extra-large, and double extra-large. It offers full protection as it is designed in the form of a jumper suit. The suit is wholly made from cotton. It is an ideal costume for people working in hot climatic conditions. It keeps your body cool and also offers outstanding protection from the bee stings. The fencing style veil adds additional protection to your head and neck. There are wires in the veil hood to self-support the mask. It is attached to suit with the help of heavy-duty brass zippers. You can fold the veil flat so that you store it easily. The elastics at the end of the arms and legs will prevent bees from sneaking under the skin. It is a great feature especially for those who are allergic to bees. There are three pockets stitched to the suit for your convenience. The Honey Keeper beekeeping suit is machine washable (except veil) and is very easy to maintain. There can be a difference in size than what is mentioned in the product description before buying contact the seller to know which size is ideal for you. Over the years Vivo has made beekeeping suits which gave protection for the upper half of the body. Since Vivo has heard its customers’ request, they have manufactured a professional full body beekeeping suit which is made of cotton. Since it is made from cotton, it is good for the beekeepers who live in tropical or sub-tropical regions. It is available in three different sizes; medium, large, and extra-large. The self-supporting veil is NOT detachable and can be zipped to the suit with the help of heavy-duty brass zippers and Velcro attachment. It is collapsible, and you can fold it back whenever you feel it necessary. There are elastic bands at the wrist and ankle regions to prevent the bees from entering into your body. It has four six double stitched pockets to help you carry various beekeeping tools. Similar to other Vivo suits, this one is also must be washed with hands only. Make sure you don’t squeeze or wing it after washing. Although this costume is available in three different sizes, it is suitable for adults only. Make sure you read the description of the size before buying the product. If you are a fan of polyester made costumes, then you must consider buying from Forum Novelties. Their suit does not mix up different types of fabrics and is made of 100% polyester. It is made in the form of a mesh type design to provide appropriate ventilation to the body. It is a kind of see-through costume. Make sure you wear something inside. The suit offers excellent protection from bee stings. But you must be careful to prevent the sneaking bees that crawl under the suit as this suit does not have elastics on the limbs. The veil is not the right veil in our opinion. It contains a hat which has a mesh sewn to it. This meshed hat will act as a veil but similar to the sleeves, it cannot prevent the bees from getting on to your skin. The best part is that the hat is removable and you can hand wash the entire costume. It is available only in one size and is suitable for most of the teens and adults. It is one of the most affordable beekeeper clothing on our list. Another product from Humble Bee which blends cotton and synthetic fabric is the 431 ventilated beekeeping suit. As the name suggests, it is a ventilated suit which provides proper airflow and comfort while you work with the bees. The veil is made in the form a fence which is collapsible and removable. Though the suit is made of cotton and synthetic fabric, it has a breathable ventilation panel made of synthetic material. It is the best ventilated bee suit on our review list. The heavy-duty brass zippers make the suit fit comfortably. It has two double stitched durable pockets and two ballistic nylon pockets for carrying beekeeping tools. The Humble Bee suit is a unisex costume meaning which it is suitable for both men and women. It is available in six different sizes, and you can buy according to your requirement. Humble bee provides a carrying case so that you can carry and store the suit at your convenience. The carrying case is made from a durable canvas cloth which has canvas handles and brass zippers. The suit is hand washable and is not machine wash compatible as the washing machines will damage the zippers and the veil. For those who feel that they require protection on the upper half of the body, you only need a jacket. You can wear anything in the bottom. It can take a simple trouser or even a jeans pant. You are correct! Bees do not have long stings which can penetrate thick clothing. It may not be suitable always to wear full body beekeeping suit. So, for those who want jacket type of beekeeping costume, Beecastle is your answer. This is the best bee jacket available out there in the market. The best part is that you will get not only the suit but also additional accessories which include a pair of gloves, a beehive brush, one J hook tool, a bee feeder, and queen cage. It consists of everything a beginner requires. The jacket is made with superior quality and lightweight fabric which offers outstanding protection against the bee stings. It has a self-supporting veil which has a fence type of design. The mask is collapsible but nonremovable. Since the veil is not removable, you cannot machine wash this costume. Wash it with hands and hang it to dry. The jacket has elastics at the waist and the sleeves to prevent the bees off from your skin. It is available in three different sizes and is suitable for younger adults and teens. If you are no taller than 5’9” than you must consider buying from DGCUS. Why from DGCUS, because it is a great suit made with a combination of cotton (65%) and polyester (35%). It is suitable for younger adults and for those who are in above-mentioned height limit. The DGCUS beekeeping suit is a full body costume which will provide outstanding protection from the bees for the whole body. The veil is collapsible and non-removable. There are beehive tool pockets, and you can carry the necessary tools required for the beekeeping. It is available in one size which is suitable for adults. Since the suit is fully elasticized at waist, ankles, and wrists, it will stretch to fit adults who are tall and broad. The DGCUS beekeeping suit is machine washable, and you must wash it in cold water only. It is suitable for both left and right-handed beekeepers. The unisex design makes it ideal for both men and women. Another product on our list which offers protection to the upper half of the body is the Forest beekeeping cotton jacket. As the name implies, it is a jacket which protects your top half, eyes, ears, and nose from the bees. This beekeeping jacket is made with canvas cotton which makes it comfortable to wear in all weather conditions. One of the best features of this suit is its veil. It is detachable and is double layered along with Velcro straps and fiberglass screen. This feature provides outstanding protection to sensitive parts. The premium design YKK brass zippers along with elastics at the waist, ankles, and wrists make it comfortable to wear for people of different heights. There are three pockets; one chest pocket and two lower pockets on the suit. The chest pocket is uniquely designed to have a slot for queen marker or your cell phone. Forest beekeeping suits are thoroughly tested for all safety standards by independent laboratories and commercial beekeepers. This unisex designed suit is available in five different sizes, and you can choose according to your requirement. Note that this jacket is not machine washable. Another costume which includes only a jacket is the Ultra Breeze beekeeping jacket. It is designed like other jackets to protect the upper half of the body. This is the second product from Ultra breeze on our list. The former one being a full body suit while this one is a jacket. The jacket is made with high-quality fabric which has layers mesh made with polyester and vinyl. These layers offer ventilation and also to provide outstanding protection from the bees. It has a detachable fencing style veil. The durable YKK brass zippers enable the user to wear and remove the suit with ease. It has multiple pockets so that you can use them to carry necessary beekeeping tools. The suit is easy to maintain and is machine washable. Before washing, remove the veil and use cold water only. The suit is available in six different sizes, and you can select any one of these that suits you best. Make sure to follow the size guide before buying. The jacket has elastics at waist and sleeves so that it will stretch accordingly. During beekeeping, you might require protection not only from the honey bees but also from other insects which gets attracted towards the bees. These insects include hornets (natural predator of honeybees) or wasps. 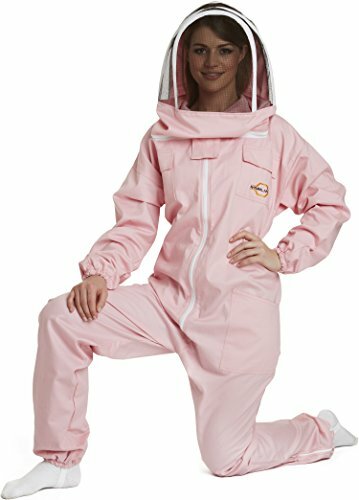 The Pest Mall complete beekeeping suit offers excellent protection from all the types of bees. It is made by blending cotton and polyester which has elastics at all the limbs. The veil is a square shaped veil with a ventilated helmet. It is self-supporting and non-removable. One of the best features of this suit is the inclusion of hand gloves. Pest mall has provided gloves to improve the protection which most other manufacturers fail to deliver. The suit is available in three different sizes and is exclusively made for adults only. You must mention the size after ordering the item. Without size information, the product won’t be dispatched. Since the veil is not detachable from the suit, it is not recommended to machine wash the costume. Use cold water and gently wash with hands. Since there are equal amounts of cotton and polyester (50%), you may not feel comfortable using this suit in hot weather conditions. Beekeeping suits list is never complete without at least two products from the Humble Bee. We already had two of them in this list, and this is the third one. 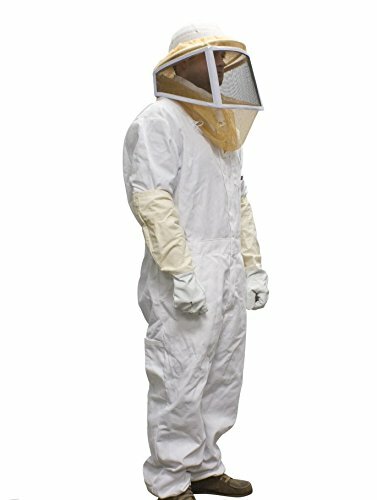 The 411-M polycotton beekeeping is almost similar to the other two on our roster except that it is not a ventilated suit. It is made from cotton and polyester in equal amounts (50%). The major difference is that the number of pockets this suit has. It has the highest number of pockets (10) than any other suits from the same company. You can carry as many tools as you can be required for beekeeping. The costume includes a combination of double stitched and ballistic nylon pockets. It has a fencing type of veil which is collapsible and removable. The suit is a unisex suit and is suitable for both men and women. There is a durable cotton canvas case with durable brass zippers which can be used to carry or store the suit. The suit is tailored by experts to prevent any size issues. It is available seven different sizes, and you can choose according to your requirement. Like any other product, if you buy this suit, Humble Bee will donate 10% to support local communities. Users in Beekeeping business do not require any formal introduction for Mann Lake. It provides a wide variety of products that are required for beekeeping. The final product in our list comes from Mann Lake and is an economy beekeeper suit. The suit is made by blending cotton (60%) and polyester (40%). It offers superior protection against all types of bees and wasps. You will feel comfortable and confident while using it. The self-supporting veil is made of two layers of fabric which is collapsible and non-removable. Around the neck, there is a flap made of Velcro straps, and the zippers meet here providing additional protection. There are elastics at the wrists and ankles for better protection. It also has elastic thumb holds for hands so that the suit provides a firm grip and protection from the bees. There are two covered pockets on the chest and another two open pockets in the hip region to help you carry tools. Since the veil is non-removable, it is advised to avoid machine washing. Use cold water and hand wash it gently. Avoid wringing after washing as it may damage the veil. Beginners, as well as professionals, use beekeeping suits for protection from bees. For amateurs, it will give confidence and will also eliminate the fear of bee stings. There are wide varieties of bees suits out there and buying a suit is purely a personal choice. Selecting a bee proof suits can be challenging sometimes. While most of them have a similar design, they vary in the veil design which is one of the critical factors in a beekeeping suit. If your beekeeping suit has a square veil, it will be an affordable one. It is because that the square veils are cheaper than the other two. The square veils are usually made of two pieces; a hat (hard) which supports the mesh. When we consider the protection, square veil offers the least, and I don’t feel comfortable while using it. 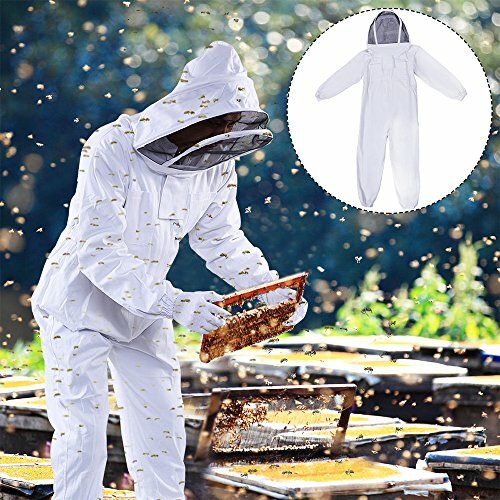 Similar to winter jackets which have hoods, some beekeeping suits will have the same design veil. You can fold this veil back whenever you feel it is not necessary. Sadly, you will feel it most of the time. Though it offers excellent protection against bees, it has poor vision. You will always feel about removing it to watch your surroundings. A rounded veil offers excellent visibility of your surroundings. You can have a 360-degree view with this veil. But, the only drawback for specific users is its size. You will feel like you are wearing a large pot around your head. Apart from the size, it offers excellent protection from bees. Many companies promise that their suits are comfortable in any season. The fact is, most beekeeping chores are done in summers. Even though the bees produce honey throughout the year, they don’t consume it very much during summers. A beekeeping suit must provide proper ventilation in hot climatic conditions. As you will wear certain garments beneath the suit, the outfit you should not suffocate you. 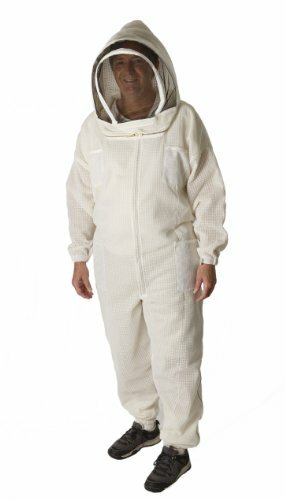 A cotton beekeeping suit is most ideal for most users. Cotton has an inherent quality of keeping the body fresh. Since pure cotton fabrics are difficult to wear and maintain, certain users will add other synthetic materials to cotton to make them flexible and comfortable. It is advised to buy a suit which has more cotton than polyester. This blend will keep you cool and comfortable while working with the bees. Nowadays layered beekeeping suits with ventilated design are increasing in popularity. As mentioned earlier, beekeeping is done in summers, and hence your suit must provide appropriate ventilation. The ventilated suits have layers of cloth so that they will offer protection as well as provide air flow to keep your body fresh. Make sure you wear any light garment beneath the suit. Note that even a good ventilated beekeeping suit will cause sweating. So, it is suggested to avoid heavy clothing beneath the suit. It will dehydrate you quickly. Wear light undergarments such as sports shorts, t-shirts, or bras. Bees will get triggered when they see dark colors. They feel dark colored things like predators and they will seek immediate defensive measures. Your beekeeping suit must not be dark colored. Many manufacturers will make their suits in white color for the same reason. Bees will feel comfortable and will not try to sting you if you use white colored clothing. A beekeeping suit does not offer complete protection to your body. It is evident that your hands and feet are exposed. You can wear shoes to protect your feet. 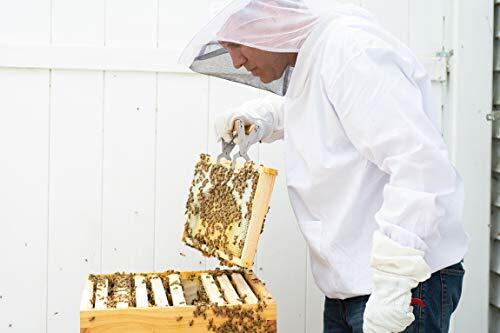 The gloves you wear for protecting hands must allow you to work with the bees efficiently without harming them. If you find additional accessories such as gloves, or any other beekeeping tools along with the suit, it is a significant buying factor. Although these accessories can be bought separately, it is good to get them together. Nowadays there is a huge number of manufacturers who provide decent beekeeping suits. You must consider several factors such as warranty, customer support, money back policy, quality, and brand value of the company before buying a beekeeping suit. A good company will provide excellent quality products with all the perks mentioned above. Go through the company website for additional information about their products. Read thoroughly about the materials used, price, delivery time, and all other related points. Maintaining bee suits is an essential step in beekeeping. Some of these suits aren’t cheap, and you can’t keep on buying new suits every time. If you learn how to maintain and clean these suits, they will serve you long. Take care of the mask properly. It is good to buy a suit which has a removable cover. Some companies provide veils which are self-supporting which means there will be wires inside which keeps the veil in its position. Since the veil protects the vital parts of your body, make sure it is well maintained. Do not machine wash the veil. Remove it from the suit, hand wash it gently with cold water and do not wring it. Just hang them to dry so that you can reuse it later. When it comes to the suit, you must be check for the voids which can pave the way for the bees. Make sure there are no bee sized holes or gaps on your suit. Ventilated or mesh type of suits are machine washable whereas some of them aren’t. Irrespective of the kind of washing you must use cold water in both situations. As done for the veil, do no wring the suit after washing it. Few companies such as Humble Bee provide a case which can be used to store the veil. If you don’t have such storage cases, hang them in an appropriate place. Makes sure you avoid sharp things which will tear or cause holes that make an entrance for bees. Q. 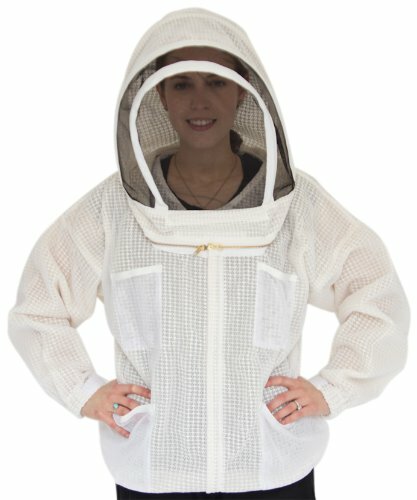 Certain users do not use beekeeping suits but why it is recommended to wear them? Professional users do not wear beekeeping suits all the time. Since the bees in apiaries are docile and familiar with their beekeeper and beekeeping activities, some advanced users do not wear them. It does not mean that these bees do not sting and neither it does not say that you should not wear beekeeping suits. Bees will attack whenever they feel they are threatened. Some people are allergic to bee stings and the pollen that is frequently found on the belly of bees. A bee sting or skin contact with bee pollen may cause allergic reactions, and some of them can be even fatal. To prevent all these mishaps, it is always advised to wear beekeeping suits for your protection. Q. Which type of veil is best? Selecting a veil is purely personal preference. When it comes to protection, square and round veil offer excellent protection, but the view is limited in the former one than the latter. Q. 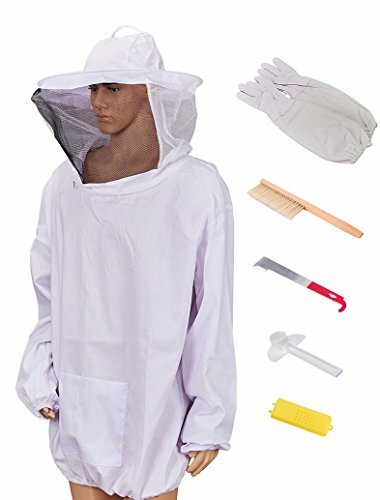 Is all beekeeping suits machine washable? No. Not all are machine washable especially if the veil is not removable from the suit. Even though some costumes can be washed in machines, you must do that by removing the veil. For cleaning instructions, read the maintenance label on the product or contact the customer support. Q. What suit is ideal for hot climatic zones? An aerated or ventilated suit is best for hotter or sunny climates. Make sure that the suit does not allow the sting to penetrate through the mesh. The ventilated suit must have layers of cloth so that it will offer protection and comfort simultaneously. Q. How do I know the correct size of the suit that fits best for me? Read the size guide correctly that is provided by the manufacturer. For a few users, there can be a mismatch even though if they buy the ideal size. This situation occurs because most of these suits are custom tailored. Contact the seller to know the suitable size for you and buy according to your need. Our beekeeping suit reviews might have helped you to know about protection from bees. Now that you have learnt about the components of the beekeeping suits especially the veil selecting the best beekeeping suits becomes easy if you understand your need. Make sure you follow the things that must be considered before buying and also understand how to properly take care of beekeeping suits. Once you gain appropriate knowledge, beekeeping is very much enjoyable. How to Use Chimney Starter? Ground Turkey vs Ground Beef: Which One Is Healthier?